Robert Wise, the Academy Award-winning director of West Side Story, took a shot at the horror genre two years after that success. The project he chose was an adaptation of Shirley Jackson's The Haunting of Hill House. With great photography by David Boulton, and excellent camera work and sound effects, it was one of the last superior examples of suggested terror. In New England some ninety years before, Hugh Crain built a house for his new wife and daughter. He called it Hill House. His wife was killed on her way to their home when the horses pulling her carriage bolted. Crain remarried but that second wife also died mysteriously, having fallen down a flight of stairs. Crain went to England where he died in a drowning accident. His daughter Abigail stayed at Hill House, where she grew old and bedridden in the nursery. She passed away when a young companion living with her neglected her calls for help. This companion inherited the house...but something drove her to suicide. The house currently belongs to a distant relative of hers in Boston, Mrs. Sannerson (Fay Compton). Dr. Markway (Richard Johnson) wants to investigate the home with a group of carefully chosen people. Markway is an anthropologist specializing in psychic phenomena and he's convinced the house is haunted. Mrs. Sannerson is initially skeptical...but agrees to this if the doctor brings along her nephew Luke, who stands to inherit Hill House. Eleanor Lance (Julie Harris) is part of the group. She's a sheltered and lonely spinster who sees the stay at Hill House as an escape from her drab existence. Most of her adult life was spent taking care of her invalid mother until her death. Eleanor lives with her sister and her sister's husband, who both treat her with disdain. It is implied that she has some sort of psychological problem. The sister refuses to let her take the family car...but she secretly borrows it and drives up to Hill House. When she gets to there, she looks up at the imposing structure and becomes frightened. Eleanor is the first to arrive. She is soon joined by Theodora (Claire Bloom), a lesbian clairvoyant...and the two wander around the house, feeling uneasy about the experiment. Dr. Markway and Luke Sannerson (Russ Tamblyn) show up. The group is smaller than originally planned because a few people have decided against coming. At dinner that night, the doctor explains the purpose of their stay: to prove the existence of ghosts. With the exception of Luke, the guests were chosen because of prior experiences with the supernatural. While in bed, Eleanor hears a loud pounding on the walls. She runs to Theodora's room. The noise gets louder. There is a continous banging on the bedroom door and the sound of a woman laughing. Eleanor and Theodora are afraid. Suddenly it all stops. Luke and Dr. Markway rush to the room but say they didn't hear anything. The next day, they find Eleanor's name scawled on a wall with chalk. Eleanor feels as if she's being singled out and believes that the others in the group are mocking her. Dr. Markway starts to wonder if perhaps some of what Eleanor is experiencing is in her mind. A cold spot in the house is discovered by the group. It's right outside of the nursery where Abigail died. They decide not to go in. At bedtime, Eleanor becomes testy with Theo. Theo reads her mind and tells Eleanor that nobody thinks that she was responsible for her mother's death. Eleanor has trouble sleeping. She hears voices coming from behind the wall and believes that a child is being hurt. She feels a tight grip on her hand and thinks that Theo is also afraid and that she's grabbing her. Eleanor screams...but when Theo wakes up, they're at opposite ends of the room. Eleanor has marks on her wrist that didn't come from her roommate. Dr. Markway's wife Grace (Lois Maxwell) appears at the house. Skeptical of the experiment, Grace decides to stay in the nursery. When Eleanor starts hearing things and thinks that the house is closing in on her, she runs into the room. Grace is nowhere to be found. Eleanor finds herself drawn to a rickety, winding staircase that leads to the attic. She gets to the top and Dr. Markway makes his way to her. He grabs at her to bring her back down...but Eleanor suddenly sees a woman quickly open and shut the attic door...and promptly faints. When she wakes up, she tells the others that the woman she saw was Grace. Nobody believes her. Feeling that it was a mistake to invite her, the doctor tells Eleanor that she must leave. Eleanor is reluctant, telling him that she belongs in the house and that she has no place to go. Still, her bags are packed and Luke is set to drive her home. Instead, she gets into the driver's seat and tries to take off by herself. Eleanor loses control of the steering wheel, which makes her think the house is trying to prevent her from leaving. At that moment, Grace Markway runs in front of the car. Eleanor swerves to avoid hitting her and crashes into a tree. She dies instantly. Hill House has claimed another victim. 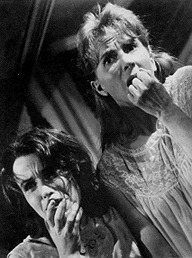 The plot of The Haunting is driven well and the ending is a winner. This film (like The Innocents) features a female protagonist who may or may not be imagining the proceedings. As with the charcter of Mrs. Giddens, Eleanor is both repelled by and attracted to the home she is staying in. An interesting premise in both stories. 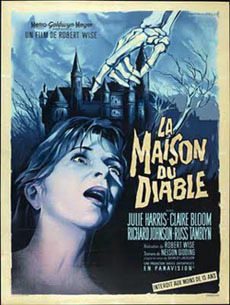 The Haunting relies heavily on the acting of Julie Harris. And it works. Her fragile sanity and fits of anger, persecution and guilt seem to mirror the house's bouts of door-slamming, moaning, children crying and general craziness. The cinematography by David Boulton should be singled out. With his camerawork, every corridor, doorway and staircase take on special creepy meanings as Eleanor runs past them. This is a classic not-to-be-missed.